For the Defendant it was a great verdict as he was not convicted of the criminal offense of Aggravated Unlicensed Operation (§511.1) which could carry with it a possible sentence of jail in the Nassau County Correctional Facility. In addition the moving violation of Speeding in a School Zone (§1180C) which carried with it many points and increased fines was dismissed, thus preventing an anticipated major impacting on the Defendants auto insurance premiums. The only charge the Defendant was convicted of was the violation, not a crime, of operating without a license. The fine imposed was minimal and the Defendant walked from the building with a smile on his face. Standing up for your rights and demanding your day in court can be a very scary and nerve racking experience. My client kept his cool during the trial and kept his composure as the verdict was read. Not every case is a winner, and each and every trial brings with it a unique set of facts. I would like to thanks my co-counsel Justin Feinman, Esq., for assisting me during the trial, as always his input, advice and experience are a welcome asset. 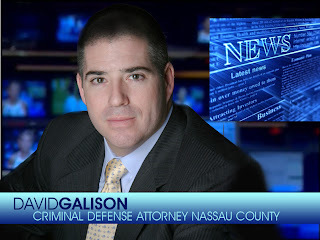 If you should every need an attorney to defend you in court with a criminal or traffic ticket matter please do not hesitate to call David Galison, P.C., 516-242-4477. The consultation is Free and the phone is answered 7 days a week.